I survived the Lake Shore Limited | Where's my backpack? The first leg of my train journey across the US was aboard a train called the Lake Shore Limited, which runs from New York’s Penn Station to Chicago; stopping at Albany to attach to a train from Boston. Preparation was intense, because I was giving up my apartment in New York and packing my entire life into suitcases to bring with me to the west coast; which will be my next home base for a while. If you ever need to make a cross-country move, seriously consider doing it by train, because when you purchase a train ticket, Amtrak allows you a) two carry-on bags up to 50lb ea b) three checked bags up to 50lb ea and c) three additional bags up to 50lb ea for $10 per bag. So for the grand total of $30 plus your train ticket, you can move an incredible 400lbs of ‘stuff’ clear across the country. That’s pretty hard to beat. Amtrak customer service leading up to the journey was great, responding promptly to any queries I had via phone, email and Twitter. Ticket booked, cases packed, I was ready to travel. The day of my trip arrived, and a friend came down to the station to see me off. All aboard the Lake Shore Limited. One thing I noticed about booking train travel in the US was the inability to reserve a seat. All seating is billed as unreserved; you get assigned a car depending upon your destination and then it’s a free-for-all when choosing your seat. At least this is what I was told ahead of time. It was not the case on the Lake Shore Limited, however. As I went to board the train, a rather surly attendant thrust a scribbled ticket in my face and barked “Here’s your seat.” I took the ticket, surprised, said thank you and then made the mistake of asking which side of the train I was on. This, apparently, was not a question she was prepared to answer, because the response was an extremely brusque “I don’t know. That’s your seat. Sit in it.” That put me in my place, literally and figuratively. Startled by the discourtesy caused by a seemingly harmless question, I boarded the train, keeping my ears open to responses to other passengers’ questions. To my delight, they were met with similar displeasure so I relaxed, safe in the knowledge that the rudeness wasn’t directed solely at me, but at anyone who dared disturb the distribution of tickets with a question. After all passengers had been stuffed into their assigned unreserved seats, said attendant popped cheerily on board and delivered a ‘Welcome to the Lake Shore Limited’ speech that belied any of her earlier gruffness. As soon as the speech was over, however, and someone asked a question, it was greeted with a withering look that could have frozen red hot lava and a dismissive answer that was to become very familiar during the nineteen hour journey to Chicago. I had been assigned an aisle seat and the person with the window seat had pulled the curtain shut and fallen asleep before we had even left the station. He was obviously a hardened Lake Shore Limited traveller who was forearmed with the knowledge that the smartest option was to be unconscious for as long as possible. I considered for a moment asking the attendant if there were any window seats I could move to, but reconsidered, not wanting to be on the receiving end of one of her glares. Words fail me when I try to describe the devastation in those glares. I briefly considered employing the term thinly-veiled hatred, but that would only have worked if there had been an attempt to veil the hatred. I resolved to keep a low profile, instead wandering down to a corridor window at the end of the car to watch the passing scenery. 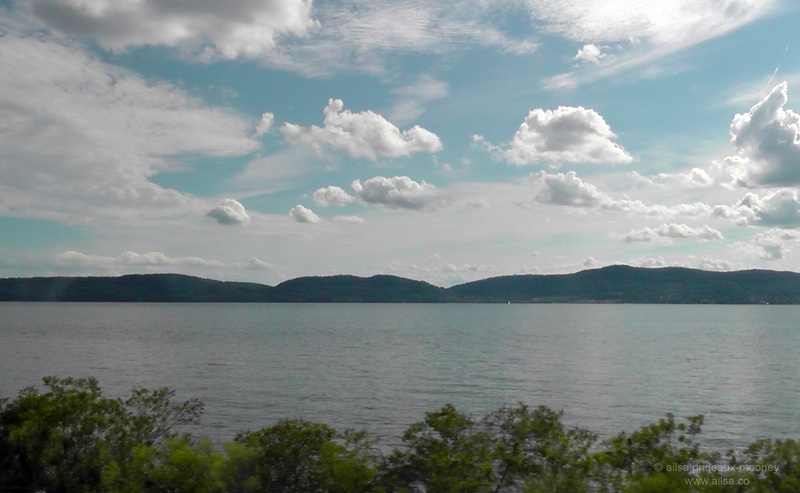 New York was pulling out all the stops for my departure, populating a cerulean sky with hundreds of marshmallow clouds over the Hudson river as we sped along the tracks, heading north into upstate New York. My spirits, already lifted by the sight of those puffy little clouds, were brightened even further when I walked through another car in the direction of the dining car, and observed a second attendant, male this time, suffering passenger inquiries with even less patience and even more disdain than his colleague working in my car. Suppressing a few pangs of guilt, I rejoiced inwardly. It wasn’t just our car that was being brow-beaten, it was every car; this was modus operandi for the Lake Shore Limited. It was a shared experience; we were all in this together. Entering the dining car was like breaching the walls of a parallel universe. I was greeted with a cheery smile and a welcome that made me want to hug the complete stranger who showed me to my table. The food and service was excellent and the atmosphere was wonderful, but I didn’t linger too long, because my dinner companion was the marrying kind. He had been married on several previous occasions, but was currently in between marriages… the dot dot dot was implied. I passed on coffee and excused myself graciously, wandering back to peer out the windows as the last tendrils of daylight let go their grip on the world and darkness prevailed. Distant lights twinkling in the black of night are only interesting to watch for so long, so I left my spot in the corridor by the train window and ambled down to the lounge car which had been attached at Albany, along with several cars from Boston. I had overheard a lady asking about Wi-Fi connection earlier. She’d been told there would be Wi-Fi in the lounge car after the car was connected in Albany, so I figured I could while away a few hours online. Unfortunately, that was not to be. Amtrak does offer Wi-Fi on selected routes, but the Lake Shore Limited is not one of those routes. The lounge car attendant slammed a coffee and sandwich on the counter, snatched the signed credit card receipt from my hand without even looking at me and walked off to chat with his co-workers. For the first time in my life, I thought about asking for the tip back. There were several other travellers huddled around the tables in the lounge, swapping stories about the rudeness they’d been witness to on the journey. A woman holding a sleeping baby sat facing a teenage boy at a table across the aisle from me. As we rocked and swayed along the tracks into the night, the boy took out a harmonica and started playing. It was a beautiful, mournful wail in the dead of night, and as I listened, I couldn’t shake the feeling that we were headed west along the Oregon Trail in a covered wagon… and not all of us were going to survive. The long days leading up to my embarkation were taking their toll. My eyelids were heavy and my bones cried out for sleep so I headed back to my assigned seat. Try as I might, there was no position I could adopt in my seat that would allow me to drift off into blissful unawareness. I glanced over at the chap in the window seat, still sound asleep, and coveted whatever medication he had taken that had knocked him out so completely. It was useless. I headed back to the lounge car, now closed down for the night. Passengers getting on board along the way staggered into the lounge in search of coffee only to be told there was nothing open anywhere until 6am. It was going to be a long night. The harmonica player struck up another aching tune and I gazed at the sign of the railway station we were pulling away from – Buffalo, New York. I checked my watch. It was 1am. I’d been on board almost 9 hours and we still hadn’t left New York state. Chicago seemed so very far away, and the thought of another two days and nights on a train to Seattle seemed suddenly bleak. Even if I survived the Lake Shore Limited, would I make it through the next leg of my journey on the Empire Builder? This entry was posted in Photography, Travel, United States and tagged humor, photography, photos, pictures, postaday, travel, writing. Bookmark the permalink. This was well-written but hard to read because I partly relived some bad travel moments of my own. I like your writing style; I have no trouble imagining the situation, the train, passengers, cranky staff. Did you get to the west coast? Despite the service, the romance of train travel comes through in your post. The sense of departing, the twinkling lights and then the wonderful harmonica! If those attendants hadn’t been so funny they should have been shot! how incredibly rude!!! A healthy sense of humour always helps, I find, Gilly. 🙂 Even the roughest of journeys can be relied upon to provide laughs and memories! Despite the bad moments, it still sounds like a fun way to travel. I wonder what would happen if an “Undercover Boss” was among those passengers? I’ve thought of taking the train cross-country, but the major obstacle was not being able to take the dog along. The other is that, for me, the destination is the journey (as they say). I have a lot of stops I make along the way to visit or explore. Amtrak doesn’t exactly make that easy. So… I end up driving. Some sections of the country seem to go on forever, but I’ve enjoyed my many drives from coast to coast. Still… I thoroughly enjoyed your post letting me know what I was missing and look forward to the next installment. Amtrak do rail passes for multiple stops, although they’re not cheap. You can choose 15, 30 or 45 day passes http://tickets.amtrak.com/itd/amtrak/selectpass but car is the only real option with a doggie on board. You also have more control over your route, which is much more fun. I looked at the rail passes, but they have all those restrictions and it’s so complicated. It seemed to me they could make it a whole lot more convenient somehow. Do you get the feeling they don’t really want to mess with passengers so much? The surly attendants you described just added to that impression. I think some countries, as in Europe for example, have train travel down to an art. I don’t think you could say that about America. It’s disappointing to me that we don’t have a better train system, especially considering the long distances between destinations. America is definitely a driving country, but that can be mind-numbing again b/c of the distances. Ailsa, this is a great description of your journey. Your frustration comes through loud and clear! Excellent post! Thanks Cathy. I’ve done a lot of rail travel in Europe and it is indeed a very different experience. Then again, in Europe passengers get priority over freight, which is not the case here. There’s much more of a driving culture in the US – what I haven’t figured out is whether there’s more of a tendency to drive here because of the state of the railways, or if the railways are the way they are because people prefer to drive. I think you could be right either way. Most people in America just love their cars and love the independence of driving. There isn’t that sense of community that Europeans share when riding the rails! Lovely Ailsa! This was reminiscent of an Agatha Christie journey sans the ubiquitous murders 🙂 Very evocative writing and photos! Excited for the next phase and welcome to my neck of the woods! Seems you brought the summer heat along with you…I hope as you got closer to the west coast the Amtrak staff was more friendly. I’ve always had great experiences on our trains but those were going up and down the coast and main corridor, not coming from the east. Wasn’t expecting temperatures in the 90s in Seattle, Debbie, that was a surprise. Hope you’re staying cool! 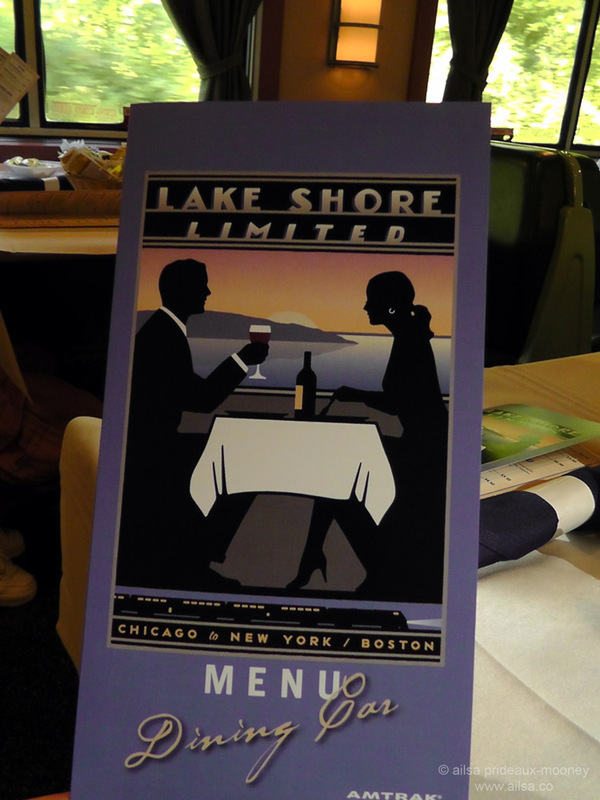 Yes, things got much better the further west I went – I think the Lake Shore Ltd is a blip in otherwise decent service. Felt I was right there alongside you Ailsa. Lovely writing. Hope you got some sleep before Seattle! It does amaze me that, with unemployment as it is, companies aren’t fully staffed with the best of the best – because there are a ton of good people out of work who’d happily be cheerful on board. Sadly it’s not just the train though. I have a friend in Louisiana who works with some of the worst and it’s driving her insane. Over the years I always wondered why companies seem to keep the dead wood and get rid of the best. I love your writing. Sounds miserable, but I’m glad you’re sharing with us, because it will be a great memory once you’re settled. I made this same move just a year ago, only in the opposite direction, and driving a huge truck filled with my possessions. I wish I’d written down the funnier aspects of the trip – it might have eased the crankiness a bit! Enjoy Seattle! The west is lovely, and I’m sure you’ll find much to do and see there. What great writing, I’m looking forward to the next instalment. Reminds me of a trip across Switzerland when some other teenagers were in my wagon and a guy played Greensleeves. I guess he saw me reading my book in English. I was still smarting over a lost love and ignored him, wonder what would have happened if I’d smiled and chatted? I enjoyed this. My longest trip on the Amtrak in the US is only about 4 hours and that’s about my comfort level. I’m sure you did make it, though perhaps slightly behind schedule? I remember my father explaining to me when I was small that the freight trains are the ones that make money, so Amtrak has to wait for them. Freight before people! Indeed, I was, umm, a tad late! It’s a rather odd state of affairs when freight gets precedence over people. Quite an eye-opener after the relative ease of train travel in Europe. Sounds like a rough start, rude staff at least, to a wonderful trip across the country, hopefully hear more of your journey soon. I enjoyed reading your story. It reads as one of those “eventually I’ll look back and laugh about it” trips. Some trains in the US are nicer than others, includes the staff, and have observation cars on the second floor of the train and watch the landscape roll past you. I hope the second half of you trip was better. You mentioned the one train person. If that train person can’t be nice to riders/customers, then he or she should be canned. I am glad you had some positive experiences on your train ride but those people who treated you and the other passengers should be reported. It seems everywhere you go the people in customer service related jobs seems to have attitude problems. I have always wanted to experience a train ride and the positive parts of your journey has encouraged me more. Thanks for your well written narrative of your journey. The video was a special added touch. I enjoy reading your Amtrak story. It reminded me the attendants in Philly…. Hope it gets a little pleasant as you head to west. Enjoy the rest of the train trip, Ailsa! Your story still had some travel romance. You should put in a complaint about the rude woman, what a terrible way to behave. Very nice writing style. You held my interest throughout. And yes, our travel misadventures can be more interesting to read about than the times when everything went well. Were there no sleeper compartments in that train? Thanks, writecrites. You’re so right, misadventures make for great stories! There were sleepers but I booked with fairly short notice so they were already taken. Chatting to a sweet elderly couple over breakfast, though, it seemed being in a sleeper didn’t exempt you from poor service. The lady said the sleeper car attendant on this trip had been wonderful, but the journey the other way had been so upsetting that she had been dreading the return. That’s sad to know—that American trains have such poor service in general (with a good experience now and then). Actually, it’s not always perfect in Europe, either. In any case, I look forward to the next post on your journey. How long are you going to be on the “left” coast? I haven’t figured out yet how long I’ll be here, but it will be for a while for sure. I’m pretty excited to be surrounded by mountains, cooler climes, fresh air and skies dark enough to see stars!! And there you have it, the state of railroad travel in the US. It’s such a shame — When I was a little girl and no one flew (only for the rich) train travel was an exciting adventure, filled with marvels (berths in sleeping cars! compartments! eating on the train!). And then planes began coming in, and highways were built and cars got faster — and the railroad system, which had worked superbly, was dismantled. And here we are. I hope the Empire Builder will be a happier story, although as someone said, it’s the bad and sad and crazy stuff that makes the most interesting stories in the end! Despite the rude employees, it still sounds like a lovely romantic way to travel. My preferred way to travel through Europe was by train. My bucket list includes a trans-Canada train ride including a ride on the The Rocky Mountaineer train which takes passengers from Vancouver to Banff (through the Rocky mountains) would be a fabulous (I think). Here’s to continuing to dream about future adventures. I enjoyed reading your post and look forward to reading the next segment. What an adventure Ailsa, I loved the story. Train travel certainly can be made by the interaction of your fellow passengers, music is a universal language. It should be people power against those rude “public servants!!!”. Looking forward to the next installment. I am sorry for such bad service! I just traveled on train from DC to Chicago and loved it–there is romance in it, despite the discomfort. Everyone was very civil, but I do wish they didn’t force people on each other randomly at meals, but that too was an experience. I felt like I was looking in on several vibrant subcultures. And the views… Ah, your post brought all of those memories back–thank you. I stumbled across your writing while searching for “wifi lakeshore limited” to see if they had finally added it to the service (or were planning to). As other have said, your description of your journey is very well written. Living in Chicago with relatives in NY, I ride the Lake Shore Limited once or twice a year in both directions. Your story is very familiar to me however, I do feel I have to defend some of the Amtrak employees though. You don’t seem to have been lucky enough to meet them, but there are some extremely polite/friendly conductors. Unfortunately, there are also a health number of conductors on that line that should be sent out to customer service re-education camp. As for the view, believe me when I tell you that you didn’t miss much in the night. It may be true that the route follows the lakes, but only when you look at it on a map of the whole US. I don’t believe there is a single point along the route where you can actually see a Great Lake. Much of the line is set behind peoples’ houses and businesses, becoming a natural dumping ground for old strollers, appliances, and other garbage. Beyond that, Western NY, Ohio, and Indiana are all pretty flat and boring to look at during the day (at least when I pass through them in the winter). * Bring a book (or movies if you have something to play them on). * Bring your own food and drink (the lunch car can get expensive). * Bring earplugs (This one is extremely important if you can get used to having them in your ears. You’d be amazed at how much of a different world the ride becomes when it’s almost completely silent. It makes sleeping and reading incredibly easy, so much so that one of the friendly conductors I was describing above told me a story about how he’s managed to sleep past his home station on a number of occasions because he was sleeping with earplugs in). * Bring a eye mask for sleeping (you can find them in the travel section of stores; in bedding stores; or in many pharmacies). With all this equipment in my travel kit, I usually manage to sleep through almost the entire trip and save myself some money on food and drink. Any time I’m not sleeping is usually occupied reading. Thanks for the tips, Shawn, and I’m very glad to hear not all Amtrak attendants on the Lake Shore Ltd are as dire as the ones on my trip. That’s quite a relief to hear, I guess I just got unlucky! Good to know I didn’t miss anything on the sights too. Very well written and entertaining. While the journey might not have been as good as it could have been, what you were left with was great memories. Sometimes the uncomfortable and unfortunate things that happen to us, make for the best stories. I look forward to reading about the rest of the journey.